The Downriver Genealogical Society represents eighteen communities in south-eastern Wayne County, Michigan. The following was written by the Flat Rock Historical Society. The DRGS Library and Newspaper Digitization Project is coming to FLAT ROCK!!!!!! Kudos to Mr. Andrew Brodie, Mr. Marc Lafayette, Mr. John Horvath, Mr. Norm Haase and members of the Flat Rock School Board for stepping up and literally SAVING the DRGS Library. They have offered the DRGS Library space in the Flat Rock School Administration Building on Division Street. The DRGS Library is scheduled to be moved before February 28th. We would like to extend a warm welcome to Sherry Huntington, DRGS President, Mary Pincek, DRGS Librarian, Dave and Kaye Warren, Newspaper Digitization Specialists and the entire DRGS Board of Directors. Your historical collections and resources will be a wonderful addition to the Flat Rock Community. The Downriver Genealogical Society (DRGS) collects documents, newspapers, yearbooks, cemetery compilations and books regarding local history from EIGHTEEN communities in southeastern Michigan. Specifically, these communities are defined as Allen Park, Brownstown, Ecorse, Flat Rock, Gibraltar, Grosse Ile, Huron Twp., Lincoln Park, Melvindale, River Rouge, Riverview, Rockwood, South Rockwood, Southgate, Taylor, Trenton, Woodhaven, and Wyandotte. Once the DRGS Library has unpacked and set up their collections, they will be open to the public. The DRGS Obituaries Collection is arguably, one of the largest collections available in Michigan, and contains the obituaries of downriver residents spanning the last century. The Downriver Newspapers Project contains the newspapers published by the Mellus Newspaper, a downriver community publication started by William Mellus at Lincoln Park in 1930, later obtained by the News Herald. These newspapers cover the local events of most downriver communities since 1930. Additionally, they offer a rare window into the “spin” or local response to many national events of the last century. As such, this collection is an invaluable resource for the community. DRGS took custody of these newspapers, obtained storage for them in a local warehouse, purchased the equipment to scan these newspapers, and has been actively digitizing this collection by their dedicated volunteers, since they were obtained by DRGS in December 2012. Thank you, Flat Rock Schools, for stepping forward when no one else would and saving our history! In the fall of 1979, an eight-session genealogy workshop was held. The persons attending the workshop desired to keep the initiative alive and met for the first time in January 1980 with fourteen people in attendance. The Downriver Genealogical Society became a reality. 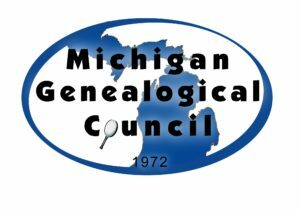 Within 10 short years, our Society hosted the statewide Michigan Genealogical Council 3 day Seminar. 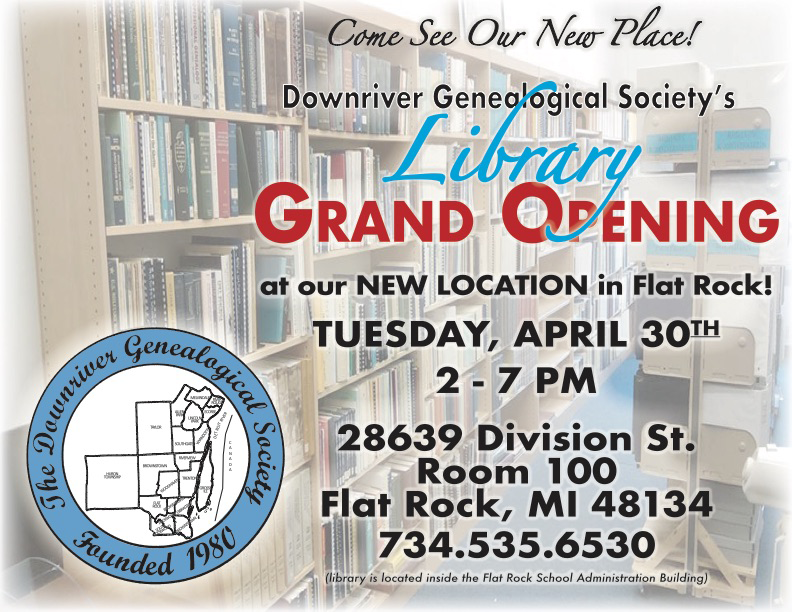 The Downriver Genealogical Society has built a large genealogical library that is beneficial to members and to all persons seeking their heritage. Our society has numerous publications that are sold at our meetings, at our library, and by mail. To see the list of publications, please refer to our publication page. Meetings: Since September 2015, meetings are held at 7:00 p.m. on the third Wednesday of the month (excluding July, August, and December). Check the Programs tab for topics and/or any date changes. The meetings are held at The Copeland Center, 2306 Fourth Street (between Northline and Eureka Roads), Wyandotte, Michigan 48192. The Downriver Genealogical Society is a proud member of the following organizations.